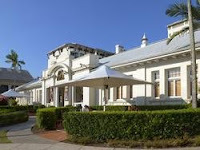 Cairns' historic Courthouse Hotel appears like it's closing, yet again. Last night, patons were greeted with a padlocked gate. This place must be headed for the knackery this time, as it's the second closure within a few months. See, WHO or What killed the Cairns CBD>? on www.tropicjazz.org.au. Its simple and its was very effective. Knock down the history and the Heritage of the city and you have a collection of dead tombstones courtesy of Demolition Desly Boyle and her Labor Government. It takes years to build up a reasonable number of people to attend places of interest. It takes a week of demolition to get rid of thm. Once they go, they will never return. Not being allowed to smoke inside premises has killed the CBD. Simple but true, the ban on smoking and an actively policed random breath test regime has killed off all enjoyment for the older folks in Cairns who fondly remember the 70's and 80's. I'm glad you "fondly remember" massive numbers of drink drivers and inconsiderate smokers giving the rest of us cancer. Yes, you are a simpleton but true. Just stating the bleedin' obvious, Outlaw. "Fondly" refers to the vibe, the music, the things that gave Cairns it's "life style personality". I'm just talking about what killed Cairns' nite-life. I am neither a smoker nor a drinking driver. I'm sorry if you are a bit confused, but it's really quite simple and it ain't going to change. The night time in Cairns is DEAD for the over 40's. The Courthouse is a great venue, the best place in town to catch a rugby match. Lets hope someone can get there hands on it and make a go of it. Lets hope it doesn't meet the fate of other Cairns Heritage Buildings. The Courthouse is still closed, and has been looking tatty and run down for a while, with no notice posted to advise patrons of what's going on, which has become typical around town. It also seems that the Salted Vue / Chocolat operations may have gone to corporate heaven? The council as landlord has also posted a notice in the window of locking out the lessee of the small Sidneys cafe in City Place. A sign of the times with 'for lease' placards blossoming along the streetscape daily. I think we should get a certain demolition company to move it to the Smithfield campus. I'm sure Desley and steve will be able to assist. Heritage ?...What heritage..
My recollection is that Desley did complain about some heritage aspects of the Courthouse being breached and the tree on Abbott St being cut down? However KitchenSlut has a very strong recollection of fronting the bar at the Courthouse shortly after the most recent owners moved in (a year or two back) to find ALP numbers man, former federal minister, and subject of many criminal & ATO investigations Graham Richardson fronting the bar? Richo seemed uncomfortable with being recognised however and didn't hang about long!